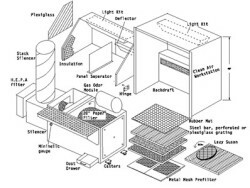 Diversi-tech’s line of industrial downdraft tables incorporate 12 gauge metal construction, built in motor & blower combinations, front or side filter access, deep dust trays, reverse pulse filter cleaning system, and several different grating options. 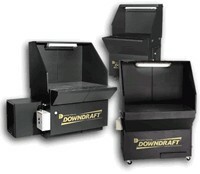 Our downdraft tables also include a unique interchangeable top section that allows us to customize the downdraft table to your specific needs. Work surface 38″ x 30″ to 48″ x 96″. Table surface: perforated grill with PVC matting. Scrubber has removal front door with explosion relief vent / meets NFPA guidelines. Push button motor starter and thermal overload protection. Internal inducers in scrubber remove dust particles from airflow and causes them to settle in water tank. Sound suppressor: unique motor cover design keeps noise level to a minimum. Water level control allows for user’s connection to a water supply line with easy water level maintenance. Optional side and back walls, casters, light kit, silencer.